Lessons I learned on this topic from a decade of blogging. 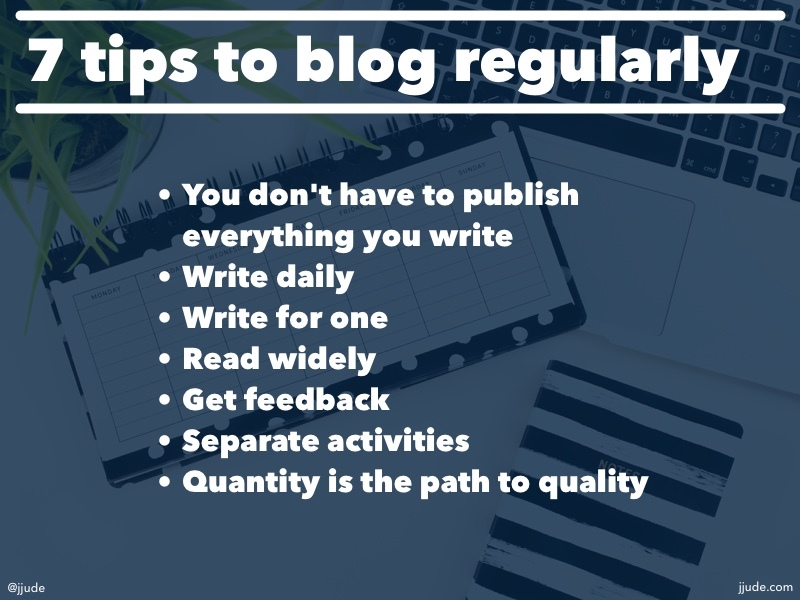 Amit Subodh[^1] asked a question that most bloggers struggle with — how to write good articles regularly. I have been blogging for more than a decade now. Here are the lessons I learned. In the initial days, I always wrote with the aim of posting. I spent a lot of time thinking about a topic. Then as I started writing, I spent a lot of time on each sentence. Obviously, I missed many days of posting. It was an unnecessary chain I laid on myself. Now, I have unshackled myself. Nowadays, I write daily. The aim is not to publish, but to write something interesting. Every day, I sit down in the same place, almost at the same time and I write for half an hour. I may write on apps I use, lessons learned from Twitter, the dilemmas I face in professional life, and so on. There are no rules on topics or structure. There is only one rule — write for a an half hour. Obviously, some of these writings get into my blog or newsletter. When I write, I imagine having a conversation with a friend. Not an imaginary friend, but a real flesh-and-blood one. Because I have been writing for years, there are folks who regularly contact me with appreciation and questions. So it becomes easier and easier to imagine having a conversation with them. This helps me to write in an easy to understand language rather than hard prose. I wrote this post itself as a conversation with Amit. I read widely - not just on topics I write. I read psychology, theology, biography and so on. I prefer to read books than vacuous articles. As the saying goes, great artists steal. If you read well, it becomes easier to steal — ideas, sentence structure, and quotes. They bring life to your otherwise banal writing. I have a file with catchy sentences from these books. I read them often and steal something or the other from these sentences. There is another exercise that I do often. I rewrite paragraphs from those books in my own style. The idea is to improve my thinking and writing style. I post some of what I write in this blog and few others in the newsletter. Sometimes, snippets of what I write ends up in emails I send to friends and colleagues. Without shame, I ask for feedback. I separate the activities involved in blogging. Generally speaking, these are the actives involved in blogging. Because I separate these activities, I am able to block time in a day and do them. My mind is not jumping from one to the other. Usual debate on quantity & quality is wrong. We all have heard that “it is quality that matters, not the quantity.” As a consumer, I expect quality. But as a maker, I have to focus on quantity to achieve quality. Makers suffer from two nightmares: fear of starting, and fear of finishing. How do you get rid of these fears? By practicing. Practice builds muscle-memory for makers. Read more of my thoughts on this question: When quantity trumps quality? Since I don’t publish everything I write, I focus on the quantity of words I write. That way, I build a muscle memory for writing. Then when I sit down to write an article, it becomes a lot easier. “I write for the unlearned about things in which I am unlearned myself,” wrote C.S. Lewis. This is the core idea behind my blogging. Blogging is one of the ways I learn. I encourage everyone to blog. It is a sure way to improve your career.